Semtech Corporation (Nasdaq: SMTC), a leading supplier of analog and mixed-signal semiconductors, and MultiPhy Ltd., a leader in DSP-based solutions focused on 100Gbps per wavelength PAM4 technology, announced today that they have entered into a strategic agreement aimed at accelerating the introduction of a 100Gbps single wavelength optical module solution. As part of the agreement, Semtech is now one of the largest shareholders of MultiPhy. 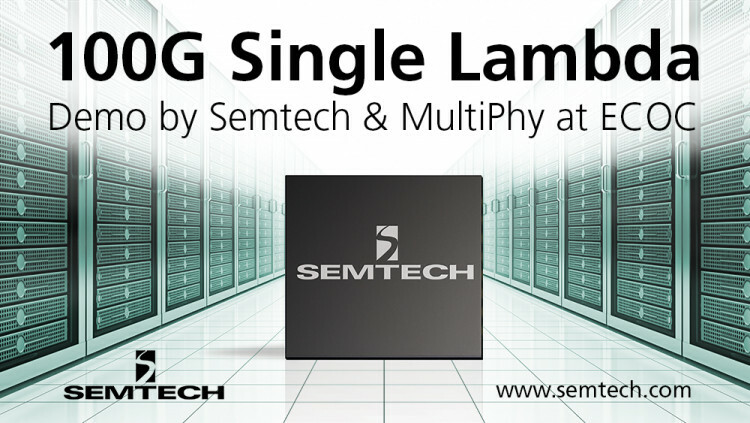 With MultiPhy’s advanced-node CMOS DSP and Semtech’s state of the art PMD (laser driver and TIA), the companies plan to offer a complete PHY and PMD solution to enable 100G modules requiring only single lane optics setting a new benchmark for cost and performance of 100G links and emerging 400G applications. The Semtech/MultiPhy 100Gbps per wavelength technology is expected to drive significant cost reductions for datacenters by reducing the number of components inside 100G optical modules. The new 100Gbps per wavelength PAM4 technology should enable the elimination of parallel optical solutions and MUX and DEMUX components used in duplex fiber solutions, requiring just a single laser and optical receiver for each optical module. In addition to substantially reducing the BOM cost, this solution should reduce the manufacturing complexity and enable smaller module form factors, which are essential for enabling increased port density in datacenters. In contrast, current PAM4 solutions in the industry are based on 50Gbps per wavelength technology, which still requires two lasers and optical MUX and DEMUX components to build a 100G optical module. MultiPhy is an innovator of cutting edge digital-signal-processing based integrated circuits for high-speed communications. The company's 100Gb/s and 400Gb/s CMOS chipsets with advanced modulation schemes are leading in the technology paradigm shift necessitated by the dramatic increase in network traffic. MultiPhy's solutions make optical networks faster, more scalable, flexible and more cost-effective for Data Center Connections. All statements contained herein that are not statements of historical fact, including statements that use the words such as “expects,” “intends,” should,” “will,” “enable,” “aimed at,” “expected to,” or other similar words or expressions, that describe Semtech Corporation’s or its management’s future plans, objectives or goals are “forward-looking statements” and are made pursuant to the Safe-Harbor provisions of the Private Securities Litigation Reform Act of 1995, as amended. Such forward-looking statements involve known and unknown risks, uncertainties and other factors that could cause the actual results of Semtech Corporation to be materially different from the historical results and/or from any future results or outcomes expressed or implied by such forward-looking statements. Such factors are further addressed in Semtech Corporation’s annual and quarterly reports, and in other documents or reports, filed with the Securities and Exchange Commission (www.sec.gov) including, without limitation, information under the captions “Management's Discussion and Analysis of Financial Condition and Results of Operations” and “Risk Factors”. Semtech Corporation assumes no obligation to update any forward-looking statements in order to reflect events or circumstances that may arise after the date of this release, except as required by law.